This was uploaded very quickly over at Stardom World, and all matches are shown in full. Except for the children in the exhibition match and Gabby, all other wrestlers have a profile here on Joshi City, you can click on their name above to go straight to it. We kick things off with a Child Fight! This match has a five minute time limit, with whichever team having the most pinfalls or submissions when time expires being declared the winners. All of these wrestlers are 12 or under, Hina and Rina haven’t had an “official” match yet as they are particularly young. Ruaka and Hanan have both shown some early signs of “getting it” but as I’ve said before, with wrestlers this young you never know if they will turn into AZM or disappear like Arisu Nanase. Hanan and Rina start the match, they trade wristlocks until Hanan gets Rina to the mat, but Rina reverses the hold and both return to their feet. Kick by Rina and she tags Ruaka, stomps by Ruaka but Hanan elbows her and they trade blows. Hanan dropkicks Ruaka, Hina comes in to help but so does Rina as things break down. Ruaka and Rina get the better of it and both apply inside cradles to their opponents, but they only get a two count. Ruaka tags Rina back in but Hana hits a judo throw and covers Rina for the three count! Team Hanan is up 1-0. Hanan tags in Hina, Hina and Rina trade holds on the mat until Ruaka runs in and boots Hina. Rina tags in Ruaka while Hanan is also tagged in, dropkick by Hanan in the corner but Ruaka hits the reverse STO. She goes for a boot but Hanan ducks it, Ruaka goes off the ropes but Hanan hits a judo throw for a two count. An STO by Hanan also gets two, she tags in Hina and Hina hits a running STO of her own. Gedo Clutch by Hina, she picks up Ruaka and goes for a vertical suplex, but Ruaka blocks it and hits a scoop slam. Crab hold by Ruaka, but Hanan runs in so she lets go of the hold. Fisherman suplex hold by Ruaka, and she picks up the three count! It is now tied 1-1. Hanan and Rina come in as the legal wrestlers but the bell rings as time has expired. The match is a Draw. This was rough. I mean I wouldn’t really ‘rate’ an exhibition match with two non-wrestler children in it but either way it was pretty awkward and disjointed. Practice is always good but I don’t know if it really needs to be televised, it can just be something fun for the live crowd while they file into the building. The first ‘official’ match of the card, as the recently returned Starlight Kid takes on the young luchadora from WWS. Hetzza hasn’t been too impressive in her Stardom run but seems to be getting better, course here she is up against a literal child so not really the best scenario to judge. Starlight Kid took the spring off from the promotion, likely for school, so she may just be here on summer loan until school starts back up again. Starlight Kid and Hetzza trade wristlocks until Starlight Kid gets Hetzza to the mat, Hetzza gets out of it and they bounce off the ropes until Hetzza hits a springboard armdrag in a particularly awkward exchange. Waistlock by Starlight Kid, reversed by Hetzza but Starlight Kid gets back on the advantage and throws Hetzza into the corner. Dropkick by Starlight Kid but Hetzza comes back with a shoulder tackle, another dropkick by Starlight Kid and she applies a crab hold. Hetzza gets to the ropes for a break, she puts Starlight Kid in a dragon sleeper but letting the hold go and applying a crab hold. Starlight Kid gets to the ropes, short range lariats by Hetzza and she hits a jumping lariat for a two count cover. Hetzza picks up Starlight Kid and goes for a sunset flip, but Starlight Kid blocks it and hits a standing moonsault for the three count! Starlight Kid wins. An actively not good match, even a step down from the first match. Starlight Kid has some nifty moves but really needs a veteran in there, plus after a long layoff she is probably rusty. Hetzza needs to be carried also so what we ended up with what just really rough. They kept it short though, so it seems they knew the situation at least. Well this is a step in the right direction. HZK and AZM are the two young members of Queen’s Quest, two teenagers with an attitude defending the honor of Stardom against the invading Gaijin. Shanna we have seen before, she toured with Stardom last summer and had several title matches, she is a veteran from Portugal. Gabby Ortiz you may not be familiar with, as she just debuted in Ring of Honor in May and won a tryout to get a chance to tour with Stardom. So needless to say she is green, I expect the veteran Shanna to do the heavy lifting on their side. HZK and Gabby begin for their teams, they trade holds until Gabby hits an armdrag. AZM comes in to help, HZK scoop slams Gabby and holds her so that AZM can kick Gabby in the chest. HZK sits down Gabby in the corner and gives her face washes, she goes off the ropes and boots Gabby in the face. She tags in AZM, dropkick by AZM in the corner and she stomps down on Gabby’s stomach. Scoop slam by AZM and she tags in HZK, HZK hits a scoop slam also before AZM returns to continue the scoop slam spree. Gabby finally fights back with elbows and they trade blows, front flip neckbreaker by Gabby and she tags in Shanna. Shanna lariats AZM before hitting the Stop Enzuigiri, double underhook backbreaker by Shanna but AZM reverses the full nelson slam into a roll-up. Dropkick by AZM and she tags HZK, dropkick by HZK and she clubs Shanna in the chest for two. Armtrap Crossface by HZK but Shanna gets into the ropes, Codebreaker by HZK and she applies a rolling cradle for a two count. Shanna avoids HZK’s Pump Kick and hits a Stunner, she tags in Gabby and and they double team HZK. HZK and Gabby trade elbows until HZK catches Gabby with a Full Nelson Slam. Running elbow by HZK in the corner, AZM comes in and both hit diving strikes off the top turnbuckle, but Shanna breaks up the cover. Gabby catches HZK in a backslide, she goes off the ropes and hits a sliding kick, but HZK fires back with an elbow. Another elbow by HZK, both wrestlers roll to their corners and tag in their respective teammates. Hurricanrana by AZM to Shanna and she applies a tilt-a-whirl schoolboy for two. AZM dropkicks Shanna but Shanna catches her with a Falcon Arrow, but HZK breaks up the pin. Dragon Slayer by Shanna, and she picks up the three count! Shanna and Gabby Ortiz are the winners! This was actually better than I was expecting, I guess the last two matches lowered my expectations for rookies. Gabby did the bulk of the work, so I was wrong about that, and while she obviously isn’t polished yet she actually looked pretty good for someone with just a few matches under her belt. Shanna played “veteran” here well which may have helped keep the match together, her sections were always tightly structured and there wasn’t any wasted time. Queen’s Quest needs to step it up if they want to be a force once Io leaves, as not being able to beat Shanna and Gabby isn’t a great sign for them. Overall an above average match, which is about all one can hope for under the circumstances. The main selling point of this match is the return of Yoko Bito, as everything else is pretty standard for Stardom’s midcard. 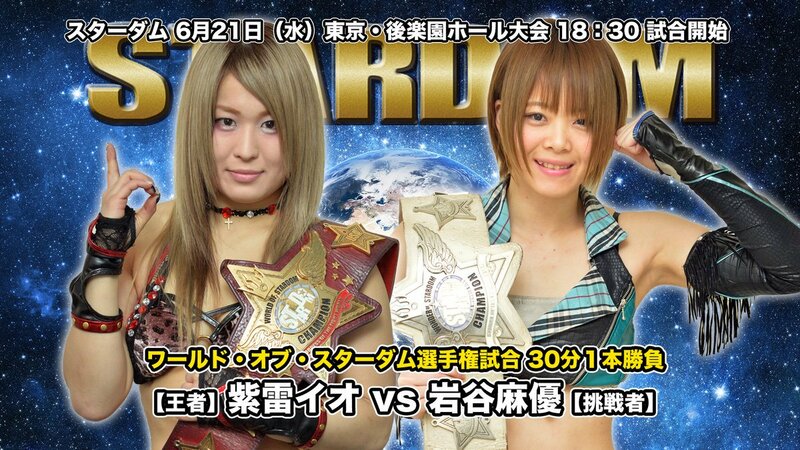 This is the fourth straight match with a rookie, as Natsuko is still in her first year in wrestling. Konami and Hiromi have stayed a regular tag team, even after Kairi’s departure, and Yoko Bito also used to team with Kairi so maybe these three will stay buddies too. I have no idea why Rebel is with Team Jungle for this match, except they need to get every Gaijin on the tour on each show since they are already paying them anyway. Team Jungle + Rebel attack before the match officially starts and triple team Bito, Konami kicks Rebel from the apron to help even the odds and all three of them attack Natsuko. Bito kicks Natsuko repeatedly in the back before tagging in Hiromi, Hiromi applies her rolling leglock and tags in Konami while keeping the hold on. Konami kicks Natsuko in the leg and covers her for two, Konami picks up Natsuko and the two trade elbows. Konami goes off the ropes but Natsuko hits a spear and makes the tag to Kaori. Kaori goes for a senton but Konami avoids it, Hiromi comes in but Kaori throws them into each other and knocks out both of them by herself. Northern Lights Suplex by Kaori to Konami, and she tags in Rebel. High kick by Konami to Rebel and she dropkicks her, giving her time to tag in Hiromi. Rebel catches a Hiromi crossbody and flings her to the mat, Rebel does the splits over Hiromi before hitting a scoop slam. Rebel gets on the second turnbuckle but Hiromi avoids the moonsault, but Rebel lands on her feet and puts Hiromi in a Torture Rack. Cover by Rebel, but it gets a two count. Rebel tags in Kaori, Hiromi DDTs Kaori and hits a low crossbody for a two count cover. Hiromi tags in Bito, jumping elbow by Bito in the corner and she chops Kaori in the chest. Kaori bridges out of the pin and knees Bito in the chest, missile dropkick by Kaori and she covers Bito for two. She tags in Natsuko, Natsuko tries to shoulderblock Bito over and finally she succeeds. Natsuko goes for the leg sweep, Bito blocks it until Rebel kicks Bito in the chest, allowing Natsuko to finish the move. Kaori comes in and hits a diving senton onto Bito, Natsuko does a diving senton as well but Hiromi breaks up the cover. Natsuko goes up top again but Hiromi grabs her from the apron, Konami kicks Natsuko in the head before Bito joins Natsuko and his a superplex. Bito picks up Natsuko but Natsuko quickly applies a few flash pins, each one getting a two count. Bito hits a jumping neck drop on both of them, Konami comes in and they both kick Natsuko before Hiromi hits Natsuko with a crossbody. Bito picks up Natsuko and delivers a brainbuster, but Natsuko barely gets a shoulder up. Bito picks up Natsuko but Natsuko sneaks in a sunset flip, getting a two. Natsuko goes off the rope but Bito kicks her in the head, B Driller by Bito and she gets the three count! Yoko Bito, Konami, and Hiromi Mimura win. It is good to see Bito back, but nothing else from this match really stood out. The work itself was fine, but with a short-ish match with six wrestlers there is only so much that they can do since there isn’t a ton of time to get a story going. Kaori was great here as she seems to be stepping it up a bit now that she isn’t the full-time Stardom Babysitter, and Natsuko looks solid for a rookie. Not a bad match and a fine casual watch, just nothing really memorable or special about it. Now the action picks up some, as we reach our first of two title matches on the show. Hiroyo and Jungle won the tag titles on March 5th from Kairi Hojo and Yoko Bito, this is their 3rd defense of the championship. Kagetsu made her return to Stardom after being out of action for about five weeks, and she came back with a different look and perhaps even more of an attitude. Kagetsu was part of the team (with Kyoko Kimura) that Kairi and Bito won the titles from, so she looks to get some revenge and get her title back. Kagetsu and Jungle begin the match, but Kagetsu won’t engage and tags in Hana. Hana dances and poses for the crowd, she challenges Jungle but Jungle pulls her by the hair instead. They trade elbows until Kagetsu attacks Jungle from behind, Jungle hits a jumping crossbody on both of them and Hiroyo comes in to help double team Hana. Double shoulderblock to Hana but Kagetsu grabs both Jungle and Hiroyo from the apron which gives Hana a chance to dropkick them out of the ring. Kagetsu goes to the ropes and sails out onto both of her opponents with a springboard plancha, Kagetsu ties up Hiroyo’s hands while Hana does the same to Jungle. They then attack both of them on the apron before Hana pulls Jungle back into the ring, Hana tosses and drags Jungle around the ring but Jungle fights back with clubbing blows. Hana takes off her belt and chokes Jungle with it until the referee takes it away, Hana tags in Kagetsu and Kagetsu spits water in Jungle’s face. Kagetsu chokes Jungle and kicks her in the back, she tags Hana back in but Jungle catches her with a lariat and tags in Hiroyo. Kagetsu is tagged in too, she kicks Hiroyo in the corner, slap by Kagetsu but Hiroyo rocks her with an elbow. High kick by Kagetsu but Hiroyo catches her with a backdrop suplex, eye rake by Kagetsu and she stealth tags in Hana. Hiroyo doesn’t see it, Hana schoolboys Hiroyo from behind but it gets a two count. Hana tags Kagetsu back in who comes in with a diving leg drop, but Jungle breaks up the cover. Hiroyo hits a double backdrop suplex on both of them, Kagetsu goes off the ropes but Hiroyo slides out to the apron. Kagetsu puts Hiroyo in a sleeper but Jungle attacks her from behind, Hiroyo goes up top and she hits a missile dropkick onto Kagetsu. Kyona puts Kagetsu in a sleeper and swings her around, Hana breaks it up but Hiroyo tosses her out of the ring. Kagetsu hits a Samoan Drop on Jungle, she goes up top but Hiroyo grabs her from the apron. Jungle joins Kagetsu but Kagetsu knocks her down into a Tree of Woe, Hiroyo comes in and then joins Kagetsu while Jungle is still hanging there, suplexes Kagetsu to the mat. Jungle pulls herself back up top and delivers the diving body press, but Hana breaks it up. Jungle goes for a powerbomb but Kagetsu slides away from her, rolling up Jungle for two. Hiroyo comes in but she lariats Jungle by accident, Kagetsu and Hana hit an assisted facebuster onto Jungle before Kagetsu hits a chokeslam for a two count. Jungle goes for a quick pin but Hana boots her in the head, Hiroyo comes in but Kagetsu hits a swandive missile dropkick on her. Hana hits a running boot onto Hiroyo, she and Kagetsu then hit running big boots onto Kyona. Ebisu Drop by Kagetsu to Jungle, she goes up and she nails the Oedo Coaster (450 Splash) for the three count! Oedo Tai are the new champions! To say that Io Shirai and Mayu Iwatani have a long history would be an understatement. For years, they were best buddies and one of the top tag teams in the world. Then Io Shirai turned on her partner and friend, leaving Mayu Iwatani behind as she went on to create a new faction. Mayu got a shot at Io six months ago, but Io won, as Mayu still wasn’t able to topple the Stardom Ace. Since then, Mayu has continued to grow and she gets another shot at the World of Stardom Championship. This is Io Shirai’s 15th defense of the title she has held for over 500 days, and it is Mayu’s third try to take it from her. Io works a headlock to begin the match, she shoulderblocks Mayu and both go off the ropes which ends with Io dropkicking Mayu to the mat. Io pushes Mayu into the ropes but Mayu tosses her down, snapmare by Mayu and she kicks Io in the back for a quick cover. Mayu puts Io in the ropes and dropkicks her in the back, which sends Io out of the ring. Mayu goes out after her and throws Io into some chairs, she goes for a dragon suplex on the floor but Io blocks it and hits a German suplex. Io slides Mayu into the ring and hits a slingshot footstomp to her back, scoop slam by Io and she hits a kneedrop onto Mayu’s back. Io drags Mayu up but Mayu hits an enzuigiri, she goes off the ropes but Io slides under the ropes and trips her. Slingshot dropkick by Io, she goes to the second turnbuckle and hits a missile dropkick, sending Mayu out of the ring. Io goes off the ropes and sails out of the ring with a plancha suicida, she picks up Mayu and pulls her up the aisle to the balcony. Mayu kicks Io away from her and hits a swinging headscissors on the narrow aisle, she then goes up to the top of the balcony and dives down onto Io with a crossbody. Mayu gets some water and gets into the ring while she waits for Io to return, Io makes the count and Mayu immediately starts stomping on her. Mayu dropkicks Io while she is against the ropes, she goes up top and delivers a missile dropkick before hitting a Northern Lights Suplex for a two count. Mayu goes for a crucifix but Io elbows her off, Mayu goes up top and she hits an avalanche DDT of sorts, with Io landing on the top of her head. Mayu goes for a suplex but Io lands on her feet, double underhook facebuster by Io and she covers Mayu for two. Armtrap crossface by Io but Mayu gets out of it and kicks Io in the face. Mayu gets on the second turnbuckle but Io hits her from behind and hits a German suplex hold for a two count. Io gets on the top turnbuckle but Mayu joins her before she can jump off, she goes for an avalanche dragon suplex but Io blocks it. Mayu jumps down to the apron while ramming Io’s head into the ring post, she knocks Io down into the Tree of Woe and hits a diving footstomp to her chest. Io flops out of the ring to the floor, she slowly returns and Mayu drags her up, but Io grabs the ropes to block the dragon suplex attempt. Mayu charges Io but Io holds down the ropes, landing Mayu on the apron, but Io is too hurt to do anything as she continues holding her neck. Io eventually charges Mayu but Mayu drags her out onto the apron, Io blocks the dragon suplex at first but Mayu eventually is able to hit it and Io flops to the floor again. Io eventually gets back into the ring, Mayu goes up top but Io avoids the diving body press. Running knee to the back of the head by Io, back up they trade elbows, palm strike by Io and she hits a German suplex hold. Mayu quickly kicks out and hits a German suplex of her own, Mayu also recovers quickly and strikes Io to the mat. Superkick by Mayu and she goes for a hurricanrana, but Io blocks it and puts Mayu in a crab hold. Mayu gets to the ropes, Io positions Mayu and goes up top, hitting a Kairi Hojo-style elbow drop to Mayu’s back. Texas Cloverleaf by Io, but Mayu won’t tap so Io eventually lets go. Trapped German by Io, but Mayu gets a shoulder up. Io goes towards the turnbuckles but Mayu grabs her leg, Io hits a dragon suplex hold but it only gets two. Io goes up top and nails the moonsault, but Mayu barely kicks out. Io picks up Mayu and goes for a tombstone, but Mayu reverses it and hits a tombstone of her own. She quickly picks up Io and hits rolling dragon suplexes, but Io kicks out at 2.9. Mayu gets Io up again and nails her super version of a dragon suplex hold, and she picks up the three count! Mayu Iwatani is the new champion! For the foreseeable future, Stardom is going to have an issue where the first part of the cards are not going to produce great matches due to the experience level and age of their wrestlers. Its not that the matches will always be bad (although some were here), it is just unrealistic to expect teenagers and rookies to put on high end matches. Both title matches were great though and also very different styles, which is always a plus. Mayu vs. Io was one of the best matches I’ve seen this year, as it was felt very different than what you’d expect while still having all the big memorable moments that Io Shirai is known for. The first half of the card is an easy skip, but the title matches both delivered.